First and foremost, when your home experiences water damage you should keep safety in mind. There are 2 reasons that water damage can be potentially dangerous. Depending on the type of water that caused the damage, it could contain bacteria as well as other containments that could make you sick. If the cause of the water damage is backed up sewage, keep the idea of contaminated water in the forefront of your mind. If this is the case, the best idea is to leave the entire job to professionals with the proper safety gear. The second reason that water damage can be dangerous is the presence of electricity. Before entering an area that has been damaged by water, make sure to turn off all electricity. Once you’ve reached out to a professional for help and the area is safe to enter, begin the resdtoration process by extracting all of the excess water. This can be easily accomplished with a wet/dry vacuum, or by using a pump. Remove excess water as soon as possible. 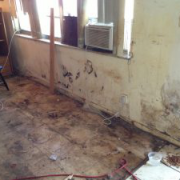 The longer water sits, the sooner dangerous mold and bacterias can begin to take hold. Don’t forget about unseen or hard to reach places, like between walls and behind baseboards. Items that have been completely soaked like rugs and furniture should be removed and taken somewhere else to dry. If your rug is wet but you believe that it may be salvagable, remove any items with color like area rugs, books, or magazines so the color from these items doesn’t bleed into the carpet. Also, place wood blocks under furniture legs so that the furniture doesn’t get damaged any further. Don’t forget about drying wood furniture as well. Increase ventilation in affected areas as much as possible. Use fans and open windows to keep the air moving as much as possible, allowing the area to dry quickly. Last but not least, allow and trust the professionals to do their job. When your home experiences water damage, investing in a professional can save hundreds, or even thousands of dollars in the long run. These professionals will come to your home and work diligently to minimize the damage to your home, property, and belongings.